So you’re probably tired of hearing how awesome the characters are, but you’re going to hear it again. Today we stumbled upon Goofy over in Toon Town. 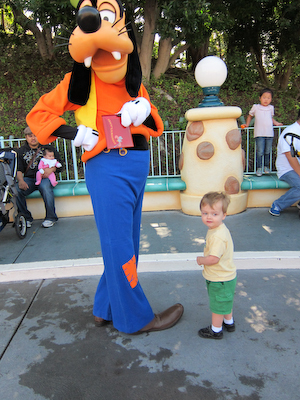 I sent Theo up on his own and he seemed willing enough, but kind of froze when he reached Goofy. 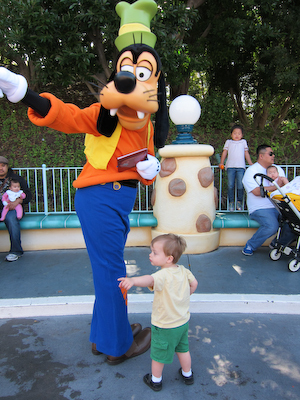 Goofy, of course, was completely unfazed. He just started doing what Theo was doing. I got Theo to look at me, but not turn toward me. Goofy had no problem with that one either, even though I accidentally cut off part of his head. And then a really, really sweet picture. I love Goofy. And that last shot is just one of the reasons why!